Learn to Scuba Dive in the Great Barrier Reef – You Can Do It, Too! Scuba diving Earth’s arcane waters is not for the faint of heart, but it’s one of those recreational activities that can be incredibly fulfilling and moving once you pass all the required courses and finish training. I found this out firsthand a couple of months ago when I received my PADI Open Water Diver certification in the Holy Grail of diving sites: the Great Barrier Reef. I’d be lying if I said I didn’t have serious reservations about suiting up and walking off the edge of a boat miles away from shore – I’m no Olympic swimmer and the idea of being 60 feet underwater for an extended period of time seemed rather unnerving (after all, we weren’t born with gills). But, at the same time, the thought of splashing into a heaving ocean of fish and other aquatic creatures sounded exhilarating. If you, too, get overcome with a sense of excitement when you imagine yourself swimming an arm’s length away from wildlife you’ve only read about in textbooks, then scuba diving is right up your alley. Below, I’ve outlined what the certification process entails, as well as what you’ll need to do to receive your diving license – your golden ticket to exploring both uncharted and well-known underwater sites. 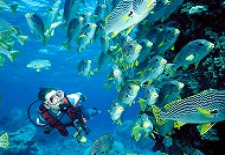 To obtain my certification, I enrolled in a five-day Learn to Dive course with one-stop-shop Pro Dive Cairns (www.prodivecairns.com). The intensive training program consisted of two days of lecture and pool training. While in the classroom, I watched demonstration videos (which paralleled the written diver manual provided) and learned terminology, as well as the fundamental rules of diving, which included never holding your breath underwater, proper hand-signing methods, and what to do in the event of an emergency. At the conclusion of each chapter I had to complete a quiz (four total) to make certain I digested all the information presented, but you can rest assured that the assessments were not very difficult and nothing to lose sleep over. When it came time to enter the pool for further training (after I was deemed healthy to dive by an on-site doctor), Pro Dive Cairns provided the essential scuba gear to myself and the other students: a mask with an attached snorkel, a wet suit, weight belt, buoyancy control device (BCDs), an oxygen tank, regulator, and fins. But, before I even strapped an oxygen tank to my back, I had to first complete a mandatory 300-yard swim (with a fins and a snorkel) and tread water for 10 minutes. During my confined water dives, I was required to master certain drills and life-saving skills such as clearing my regulator (in the event it fills up with salt water), manually inflating my BCD, as well as removing my mask while submerged. Other tasks included flooding my mask and clearing it (not the most fun part about the training, but important nonetheless), a compass swim, controlled emergency swimming ascent (to be carried out if air supply is lost 20 to 30 feet below the surface), and demonstrating what to do if the regulator happened to get knocked out of my mouth. After pool training wrapped up, the on-land portion of the course culminated with a 50-question final exam (75 percent is passing for PADI open water courses). The next day, I boarded a boat and cruised to the fringes of the Great Barrier Reef, where even more training took place. My dive instructor, Claire, escorted me below the surface and watched on as I executed the same drills and tasks as I did in the confined water dives, which sounded daunting because I was in the middle of the ocean, but it actually wasn’t at all. Plus, one thing that calmed my nerves underwater was Claire's encouragement and patience throughout the entire process. At the end of my fourth dive in the Great Barrier Reef, I officially became a certified diver and no longer needed an instructor to accompany me on my jaunts – just a buddy. With the umbilical cord severed, I was free to wander (well, down to 60 feet) the intricate labyrinth of reefs at my leisure, discovering their most coveted inhabitants, and taking in the perpetual splendor. These post-certification dives provided intimate visits with the Great Barrier Reef’s awe-inspiring marine life, something I won’t soon be forgetting. If you’re looking for complete immersion – and I mean that quite literally – into an aquatic ecosystem you’d be hard-pressed to find elsewhere, then I highly recommend procuring your PADI Open Water Diver certification in the Great Barrier Reef. 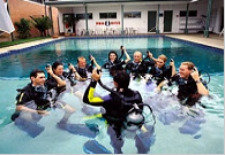 Pro Dive Cairns’ five-day Learn to Dive course makes this easy to do and is priced from just $797. The $797 fee does not include drinks on the boat, as well as use of underwater cameras, which can be borrowed for $30 per dive. If you're already certified and want to tag along on Pro Dive Cairns' excursions, click here to choose the program that best fits your desires. Buy your own mask before diving. The masks most dive programs have readily available may not fit your face properly, which can lead to a flooded mask or mask squeeze – a definite nuisance when trying to scope out incredible wildlife. Ask your dive instructor lots of questions. There’s no such thing as a fatuous question. Once you’re certified, your dive instructors will likely remain on the boat, so you’ll want to make sure you know the rudiments before you and your dive buddy go off exploring by yourselves. Attend all dive briefings with the dive master on the boat. It’s here that you’ll learn important information on how to navigate the dive site. Rent out an underwater camera for one dive. The pictures you’ll take will make a nice memento. Make yourself at home on the boat. Go on all nine dives. Some are later in the evening, some are early in the morning, but they’re all worth getting suited up for. Flip through the fish identification books after each dive. It’s more fun to know what you came face-to-face with 60 feet below the boat. Get to know the other divers. When I went participated in the program this past August, I met people from all corners of the world, and I still keep in touch with them. Expect to see all the wildlife under the sun. Pro Dive Cairns tries to anchor at the best dive spots, but animals can roam wherever they’d like. Be afraid of sharks. The only sharks I encountered were docile reef sharks and they paid me no attention. Separate from your buddy. You are each other’s lifeline down below and it’s important you stay together, even if you see a really cool animal in the distance. Bring a lot of clothes or personal items on the boat. Two people are assigned to each cabin and it’s definitely close quarters. Besides, you’ll be in your wet suit most of the time. Bring money on the boat. There are no cash transactions while on the reef. If you’d like to buy a soda or souvenir, one of the instructors will check your name off and all incurred charges can be settled back at the dive shop. Be afraid to pop up to the surface to get your bearings straight in terms of your location from the boat – it can get disorienting down there. Just be sure to signal to the lookout on the boat that you’re OK.
For a complete run-down on what you’ll need to do to become a certified diver (including the age requirements), as well as more information on scuba gear, classes, and training, visit www.padi.com/scuba. 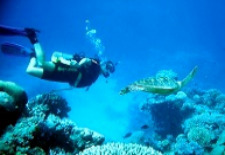 Before you go, read our Great Barrier Reef Travel Guide for insider tips and information.